If you are stuck on the roadside then your first thought will be to seek help as soon as possible. In this particular situation you actually need help from a towing company who will tow your vehicle safely to the desired destination without damaging it. If you are covered under CA roadside assistance then they will inform the companies in your area and will ask them to assist you in no time. It’s solely their responsibility to spot a reliable towing service company and they are known to perform their job in the best possible manner. Now suppose you are not covered under a roadside assistance plan, then in that case you need to spot a towing service company by yourself. Thus, it’s very important that you know how to differentiate the good company from the bad or non reliable one. 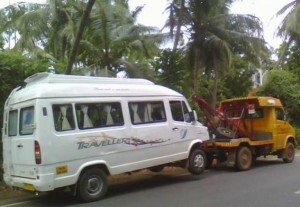 Word of mouth is considered as one of the best way to spot a good towing company. Ask for recommendation from your family members and friends. Other than this, you can also take help from online sources, find out for how long they are rendering service and are they satisfying the demand of their customer or not. Compare the various aspects of different companies and then select the Towing Alameda company that will goes well with your need and requirement. This search will surely help you to find a company with customer rating. As life is unpredictable so you need to make these search beforehand, so that when you are stuck with the problem you do not have think what to do.